Design – we provide comprehensive design solutions as well as a bespoke CAD design service. 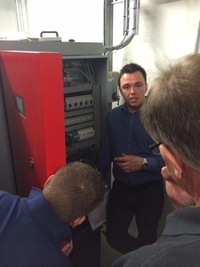 Training – we provide installation and support training in our training centres as well as bespoke on-site training. Technical support – telephone and on-site support from our team of service and commissioning engineers. We hold a comprehensive library of technical data and advice. Facing a problem? Look here and there’s a good chance you will find the answer. Through our technical and CAD team we offer assistance with the design of systems, the specification of components, and producing CAD drawings and schematics. Too often we see this as the weak point – and with the wrong design it doesn’t matter how good the installer or boiler is. 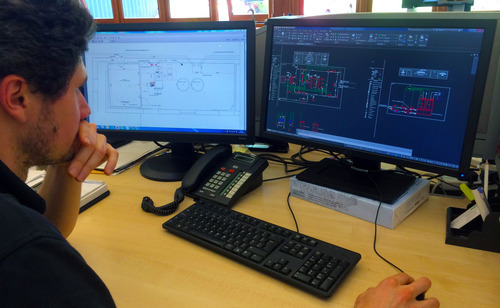 We can provide a range of design services from the provision of standard designs right through to bespoke design work for district heat networks and complex control strategies. Much of our training is done on a bespoke basis and onsite with you. We would expect to help with onsite training and commissioning from the outset of any partnership with a view to building your self-reliance and expertise as quickly as possible. We have a strong and highly experienced team of engineers that provide technical support both over the phone and onsite. We have a strong relationship directly with ETA in Austria and have a strong track record in resolving issues. .
We have experienced engineers on the ground that can help – not just someone on the end of a phone reading out of a manual. Whilst we all hope that issues don’t arise, sometimes they do. Denergy is very much there to help: we have probably experienced and seen most issues before which always helps to speed any problem resolution. And if we can’t deal with an issue remotely we have experienced engineers that are available to visit site. We have a library of technical material, much of it proprietary to us, that is available to our partners. We also issue and circulate technical bulletins with devlopments, new products and the like.